LOS ANGELES, CA--(Marketwired - Oct 3, 2016) - Blaze Fast-Fire'd Pizza, the nation's leading fast casual artisanal pizza chain, announced today that it will open a restaurant at iconic STAPLES Center, its first location inside a sports and entertainment venue. 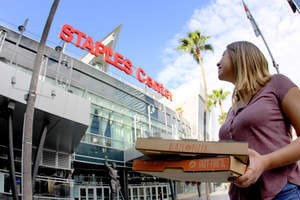 As a part of the agreement, brokered by AEG Global Partnerships, Blaze Pizza will be the exclusive pizza of STAPLES Center and an official partner of the LA Kings. The popular restaurant chain joins the ranks of other fast casual, chef-driven concepts at STAPLES Center, including BS Taqueria, Dave's Doghouse and Ludo Bird, all part of an initiative by AEG and Levy Restaurants to provide a more elevated guest experience. The modern day "pizza joint" will be located on the main concourse, near Section 109 next to the Wells Fargo activation and ATM. "STAPLES Center is known for being a best-in-class sports and entertainment venue. We're proud to align with this iconic venue that shares our commitment to putting the guest experience first," said Jim Mizes, president & COO of Blaze Pizza. "Through our partnership with STAPLES Center, Blaze is redefining the way people think about and eat pizza, both inside the stadium and out." Since its first restaurant debuted in 2012, Blaze has quickly become one of the nation's hottest restaurant concepts, cultivating fanatics by offering artisanal pizzas that are both fast and affordable. Each location makes its dough from scratch, using a recipe developed by critically acclaimed Executive Chef Bradford Kent (the "Pizza Whisperer") to produce his signature light-as-air, crisp crust. The generously sized personal pizzas are then sent to a blazing hot open-flame oven -- the centerpiece of the restaurant -- where dedicated pizzasmiths ensure that the thin-crust pies are fast-fire'd and ready to eat in just 180 seconds. "At STAPLES Center, we are continually looking to revolutionize and upgrade our concession offerings for our guests," said Lee Zeidman, President, STAPLES Center. "As we modernize our food and beverage options, Blaze was an obvious choice to partner with. We are proud to provide our guests with higher caliber options, including chef-envisioned, freshly made food prepared with simple ingredients, right here at the arena." Driven by its commitment to "Intelligent Choices for Our Pizzas, People & Planet," ingredients in Blaze's pizzas and salads are free from artificial colors, flavors and preservatives. Additionally, the restaurant uses eco-friendly packaging, with pizza boxes certified by the Sustainable Forestry Initiative, salad containers produced from recycled plastic, and numerous compostable materials. "We are looking forward to introducing our fans to Blaze, a company that's ingenious approach to the pizza industry highlights our own commitment to offer our fans the best experience in live entertainment," said Russell Silvers, Senior Vice President, AEG Global Partnerships. Blaze Pizza is a modern day "pizza joint" known for its artisanal pizzas, freshly made salads, blood orange lemonade and s'more pies. Each restaurant features an interactive assembly-line format that allows guests to customize one of the menu's signature pizzas or create their own, choosing from a wide selection of fresh, artisanal ingredients -- all for one low price. The generously-sized 11-inch pizzas are then sent to a blazing hot open-flame oven -- the centerpiece of the restaurant -- where dedicated pizzasmiths ensure that the thin-crust pies are fast-fire'd and ready to eat in just 180 seconds. Each restaurant makes its own dough from scratch using a recipe developed by critically-acclaimed Executive Chef Bradford Kent (also known as the "Pizza Whisperer"), to produce his signature light-as-air, crisp crust. For pizza fans with specific dietary needs, Blaze Pizza offers gluten-free dough and vegan cheese. The STAPLES Center restaurant will serve an abbreviated menu. The first Blaze Pizza restaurant opened on Aug. 6, 2012, in Irvine, California, and quickly gained attention for its chef-driven recipes and "build-your-own pizza" assembly-line format. Now ranked as the leading fast-casual pizza chain in the Technomic Top 500 Chain Restaurant Report, Blaze Pizza is building momentum and developing a cult following as it expands across the country. The company currently operates 153 restaurants in 31 states and Canada, including the major metropolitan areas of Los Angeles, New York, Chicago, San Francisco, Las Vegas and Dallas. Founded by Elise and Rick Wetzel (co-founder of Wetzel's Pretzels), the concept is backed by investors, including LeBron James, Maria Shriver, Boston Red Sox co-owner Tom Werner and movie producer John Davis. STAPLES Center has clearly established itself as the sports and entertainment center of the world. As the home of four professional sports franchises -- the NBA's Los Angeles Lakers and Los Angeles Clippers, the NHL's Los Angeles Kings and the WNBA's Los Angeles Sparks -- STAPLES Center has proven to be a home court advantage for the local teams. The AEG owned and operated arena continues to distinguish itself as the host of major, high-profile events of national and international distinction including the 2004 & 2011 NBA All-Star Games, 2002 NHL All-Star Game, 2000 Democratic National Convention, 2009 World Figure Skating Championships and 15 of the last 16 GRAMMY Awards shows. STAPLES Center's fifteen years have also been marked with performances and special events that brought international stature to the downtown Los Angeles venue including, concerts by Bruce Springsteen and the E Street Band (who played the arena's first-ever public event on October 17, 1999), Mana, Prince, U2, Paul McCartney, Garth Brooks, Usher, Jay-Z, Kanye West, Taylor Swift, Roger Waters, Britney Spears, Beyoncé, Katy Perry, Sade and Justin Timberlake, as well as world championship boxing, family shows and special events. Hosting over 250 events a year, the arena's reputation for world-class amenities, features and commitment to quality of service and the guest experience is second to none. Staples, Inc. entered into a 20-year agreement to become the arena's Naming Rights Partner on December 1, 1998, which has since been extended into perpetuity. Headquartered in Los Angeles, California, AEG is the world's leading sports and live entertainment company. With offices on five continents, AEG operates in the following business segments: AEG Facilities, which is affiliated with or owns, manages or consults with more than 120 preeminent arenas, stadiums, theaters, clubs and convention centers around the world, including The O2 Arena, the Sprint Center and the Mercedes-Benz Arenas; AEG Live, which is dedicated to all aspects of live contemporary music performances, including producing and promoting global and regional concert tours, music and special events and world-renowned festivals; AEG Real Estate, which develops world-class venues, as well as major sports and entertainment districts like STAPLES Center and L.A. LIVE; AEG Sports, which is the world's largest operator of sports franchises and high-profile sporting events; and AEG Global Partnerships, which oversees worldwide sales and servicing of sponsorships, including naming rights, premium seating and other strategic partnerships. Through its worldwide network of venues, portfolio of powerful sports and music brands, AXS.com ticketing platform, AXS cable television channel and its integrated entertainment districts, AEG entertains more than 100 million guests annually. More information about AEG can be found at www.aegworldwide.com. Blaze Pizza®, Fast-Fire'd®, the horizontal logo design, and the proprietary names "Pizzasmith", "Intelligent Choices For Our Pizzas, People & Planet" and related trademarks are the property of Blaze Pizza LLC.